- a monthly series of 7 local walks that brings together the sacred spiral path of the labyrinth with the wisdom of the chakras. Heaven and Earth, mind and body. As you transform yourself, you transform the world. Using labyrinths as our destinations and as physical embodiments of the chakras, we will walk local labyrinths and the paths in-between to activate each of the 7 chakras and to align the chakra system. You will receive the gifts, qualities and lessons of each chakra as you walk, and then take these home with you. You may notice that opportunities present themselves for you in the dailyness of your life. Out of the activation from these sacred walks, you will embody and embrace the healthy fullness and balanced expression of each chakra. “A labyrinth is a symbolic journey . . .
You are invited to cross a threshold into a sacred space ~ to walk a sacred path ~ and to align, balance and integrate the different energy centers within your body, and in turn, to experience the sacred wholeness within yourself. Using labyrinths as both our destinations as well as physical representations of the chakras, we will give ourselves a morning each month to experience a nourishing, healing and sacred walk. Labyrinths and chakras are beautiful reflections of the other. They are both a spiral in and of themselves, and just as each chakra is similar yet distinct from the other chakras, each labyrinth is also similar yet distinct from the other labyrinths. No previous knowledge of chakras or labyrinths is required for this journey. Only your desire to walk, to experience yourself more deeply and to (re)connect with your core self! 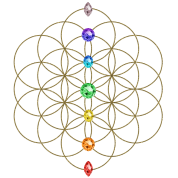 On one Saturday morning each month over the course of the next 7 months (November 2013 ~ May 2014), we will walk from the Root to the Crown Chakra. 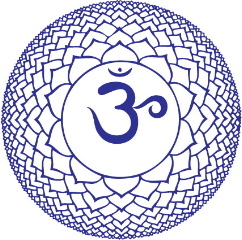 Each month we will engage with and explore one chakra as we will both walk to a labyrinth and walk the labyrinth itself. We will gather and come together as a community of women. I will then offer a short overview and wisdom teachings of each chakra and labyrinth, along with a specially created and recorded Chakra Chant. You will also get to pick and keep your personal Chakra Wisdom Card. These will provide the context and the container for the experience as you then walk to the labyrinth that represents the particular chakra. "A labyrinth is an ancient mystical tool that connects us to the depths of our soul so that we can remember who we are." To walk from one labyrinth to the next, we will walk on mostly local bike and foot paths, often along the creeks of Boulder, in neighborhoods, through parks, as well as through the campus of the University of Colorado. Here, you will have the opportunity and choice to walk in silence or in community. My intention is that not only will you experience Boulder in an intimate and personal way, but that you will also see things that you've never noticed before, despite having driven or ridden by numerous times. We will complete each walk with a silent walk in the labyrinth. The journey between the labyrinths, from one sacred site to another, will be a walking ritual that will give you an experience of sacred pilgrimage. The length of the day's walk will be determined by the distance between the labyrinths that we are walking that day. We will walk as a group, but you can choose to walk in contemplation, silence or community. Each day I will provide you with a map so that you can feel confident to find the destination if you become separated. 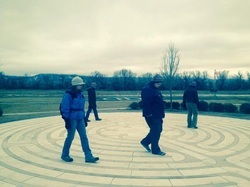 The experience of walking each labyrinth is an experience of sacred pilgrimage in and of itself. Simply, labyrinths offer us a respite from our busy lives with an invitation to pause, to enter a sacred space, and to walk with an awareness of being in a different space. While inside a labyrinth, we can ask a question, create an intention, receive an answer, or simply walk and be with the experience. We can surrender to the path and know that it will take us to the center - our center, and back out into the world again. 8:45 Meet and gather at a designated destination*, and then carpool to starting point. 9:00ish Cross the threshold into the sacred container of the CROWN Chakra Walk. 9:30ish Walk to the Labyrinth/Chakra. 11:00ish Reflect, Journal, and if you feel like it, share your experience with the Chakra Walks community. 12:00 Set intentions for upcoming month and complete the Crown Chakra Walk. *YOU WILL BE GIVEN THE LOCATION DETAILS WHEN YOU REGISTER FOR THE WALK. $24 - Includes guided walk and teaching/offerings on labyrinths and chakra wisdom. Please feel free to contact me if you need any additional information or have any questions that you need answered before registering. I would be happy to talk with you. Looking forward to walking and to sharing the gifts from the path with you! I've known Sarah for 20+ years, and out of my knowing her for so long, I would want to support her out of who she is and that I would trust that she's up to something that would be of service to others. But, I have discovered out of doing the Chakra Walks with her that this has been such a contribution and gift that I would highly recommend this to anyone who's interested in increasing their awareness around themselves and what's happening on the planet today. The simplicity of Sarah's chakras labyrinth design can serve many without without having any experience or knowledge of the chakras at all. It's all right there to be mined and experienced simply through the walking. It's truly profound. I would recommned this to anybody on their journey of self-discovery. Simple profound and remarkably insightful. Moreover, Sarah's support, insight, and the unconditional wisdom that she brings to these walks is above and beyond anything I have experienced. If you're looking to be engaged in any soul searching, then this is a very simplisitic and opportune experience. I am eternally grateful and so thrilled that I have been a part of this experience. She reflects the potency of the experience in a way that brings greater depth, and as such, the experience of these walks would not the be same without her. Her presence and contribution is in large part what makes these walks so profound. These walks and the way in which Sarah has created them has supported my life's path immeasurably. Sharon Fletter ~ Akashic Reader, Preschool Teacher. 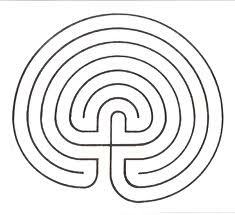 I have been aware of and walking labyrinths for a number of years now. I found walking the labyrinths to be meditative and opening. More recently, I joined Sarah on on a few labyrinth walks that incorporated some of the chakras. It was also opening and meditative but it also brought a whole other dimension to the process. One I never really anticipated or expected. In many ways walking with a specific chakra in mind revealed more than I could ever have imagined. It was not clear to me at the outset how much more I could or would experience. The analogy of pealing back the layers of an onion comes to mind as each successive walk brought more depth and awareness to me on various levels. Sarah is a wonderful leader. She makes the walks accessible and easy. She creates an environment for you to experience and feel whatever is right for you. There is no pressure or expectation. Sarah has a way of helping you to deepen your experience and understanding in a safe and supportive container. I am grateful for the opportunity to explore and learn through walking. Walking has long been one of my favorite ways to clear the mind, open the heart, and uplift the spirit. Chakra Walking with Sarah doubles and triples these benefits. Sarah brings to her walks knowledge of the energy inherent in each Chakra and helps you explore how these energies may be playing out in your life. Beginning with the Root Chakra Labyrinth, and walking your way to the Crown Chakra Labyrinth over the course of many weeks, allows you to explore the dimensions of each level of energy. Sarah takes walking a step farther and a step deeper; she turns the trail into a metaphorical path for life and the walk into a journey. It’s no longer one foot in front of the other, but one energy connecting to the next. Sarah’s meditative, joyful and explorative approach helps create an environment that is friendly, balanced and caring. Sarah innately respects the walk, the path, the process and the individual. Wherever you are in your life, Sarah meets you there with respect and honor. Every step and every breath are important, and Sarah helps you live that. At the end of a walk Sarah asks: “Let me know what comes in this week”. In the beginning we were asked to pick a card. I picked out for myself "Order", because that is what I was seeking. However, when I picked the card out blindly from Sarah as she passed them around the circle, what I got was "Structure". The card read "The structure of my life is flexible and strong, and supports me to experience the good and joyful". To me what I immediately heard was that I am to be "flexible" and that in the flexibility my strength lies. And that by being flexible I will "experience the good and joyful" in life ...and on the Camino which lies ahead! Lucy K.
"Thank you again for your gifts. 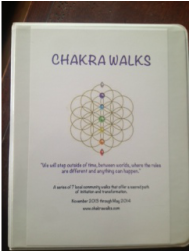 The chakra walks have been life changing for me!" Stacy H.